If you already have a good idea of where you want to base your business, you can look for an office and sign a lease. Renting a lease office gives you several advantages, such as an official address required for registration of your company, and a fixed telephone number. Above all, the fact that your company has made a lease agreement proves certain reliability of your company as a legal entity. See also: the list of real estate agents who can help you find an office in English. These offices are available for rent on a predetermined time basis or on monthly contracts. 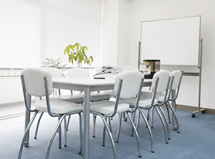 Office furniture and conference equipment, as well as reception and secretary services may also be offered. Since this solution is more convenient and cost effective than leasing new office space, it is often used as a first step by start-up companies. Also, in some cases, you may be able to use the address of your serviced office when registering as a Japanese company. This service allows you to take advantage of various office features without renting an actual office. You will be able to acquire a local address as well as a phone number which can be used for corporate registration. Your receptionist will answer the phone in the way you would like, and you have access to business lounges and meeting rooms when you need physical work space. It is an especially convenient service for start-ups and expanding global enterprises. Available at 23 top locations in Japan and over 150 global locations. Perfectly arranged compact serviced offices for project space, branch offices, start-ups and downsizing along with flexible co-working spaces. Full size office buildings with rental meeting rooms and bilingual reception (BUREX properties). Cost-efficient and comfortable. Central Tokyo locations with prestigious addresses and excellent train access. The Executive Centre Japan K.K. For documents such as contracts, ledger sheets, drawings or important sensitive archives which require secure preservation or destruction, record management services provide an excellent solution. In case you don’t have enough space at your office or lack the security measures to sufficiently protect your records, record management services are a convenient alternative. Free temporary office space is offered by the JETRO IBSC and some local governments’ IBSCs. Upcoming entrepreneurs can use this space for a period of up to 50 working days. Consultations with industry experts and accountants, use of meeting rooms and exhibition halls as well as access to a variety of business and trade resources is also available. Often times, temporary office space comes equipped with basic supplies such as desks, chairs, telephones and Internet. You will only be charged the actual telephone and copy fees. Here is a list of some useful websites you may want to refer to when starting a business in Japan.